UPDATE: I’ve been asked what the actual number was. It was a whopping 41, 483! We saw an increase almost across the board on applications submitted through the Planning Portal last month, a large increase from July last year. Could this be down to growth in general as the economy picks up? Or is it something we are doing right? We hope that it’s both! 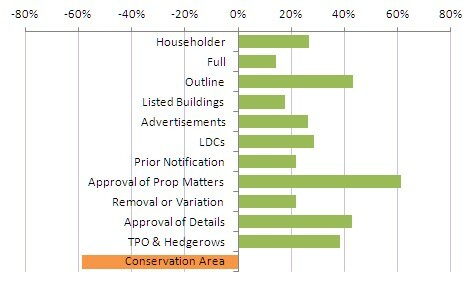 The only application type we saw a downturn in was Conservation Area applications. This could be a result of changes in regulations, but we’ll keep an eye on it! The figures include the total number of applications through the Portal (to all local authorities). The percentage increase overall and by application type will vary from authority to authority. Hope that clarifies. I was under the impression that the rolling 5 years was up and Developers put in applications to meet the (apparent) July deadline in case applications were ‘met’ and therefor year 6 had reduced availability. It was generally thought that year 6 would in fact require even more housing but… applications were put in, in case the presumption was incorrect. It would be interesting to know the percentage of ‘outline’ planning applications against ‘full’ planning applications… and the same for a more ‘normal’ period. It might be that many Developers rushed to fill their future housing bank with outline applications! Just a thought. Planners should be paid on performance related pay the more positve passes the more they could earn to there salary, my view is if they had to earn for what they do they would be short in thevpay packet as for the committee member thry should vote in secret and not a show of hands so they keep in line with the other members who think they the know the pkanning laws. Well you did ask for comments! « Planners plan ahead, don’t they?